1. Parking lot west of entrance to park, off Route 6A in Brewster. 2. End of Flax Pond Road. Drive in main road, take first left, follow to end. on dirt road at sign. Nickerson State Park can be hiked in fall, winter, and spring, but not in the summer. Hordes are encamped in the park during the summer, and the poison ivy covers the trails. markers, and occasionally see red horse trail markers. Beginning at the main entrance parking lot (001), walk southeast through the little woods, cross over the main road, then pick up the bike trail on the other side. Follow it to the utility right of way (002). Then walk east along the woods on the south side of the right of way. In about 0.2 mile, you will walk around a pit. Immediately after, a hiking trail is visible heading southeast into the woods (003). It's a pretty walk through tall trees and over a steep hill (004-005). At the bottom of the hill, a woods road cuts in (006). You can't go any further, anyway; a swamp lies ahead. Walk northeast on the woods road to a triangle of paths (007). Curve around to the right, walking uphill until the second intersecting path goes off the right. Actually, either one will do, but the second path is more visible. If you continue uphill, you will wind up in the Robinwood housing development. Continue until you intersect the telephone right of way (008). Follow it until you reach a foot path on the left (009). Walk south briefly to another woods road (010). Walk southeast on it to a parking lot near the shore of Cliff Pond (011). Look for a foot path heading east along the north shore of Little Cliff Pond (015). Continue to cross a wide dirt road between Little Cliff Pond and Higgins Pond, just above a gate (016). Note: (012-014) have been deleted. The walk through "Fox Den" is now blocked by building lots. Look for a footpath heading east along the north shore of Higgins Pond. Ignore the side trails until you get to a point near the east shore of the pond. Then continue due east on the wide footpath away from the pond. You will reach another wide dirt road, in another 0.2 mile. (017). Walk south on it as it leads you around Higgins Pond (018-019). The road ends just west of Eel Pond, which is itself just below Higgins Pond. It is also possible to explore paths to Higgins Pond, and walk along it until you reach the woods road, but for that you are on your own. At the T intersection, you could go left, reach the southern perimeter of the park, and follow the bike path to the west. We suggest walking north for 0.1 mile to pick up another woods road to the west (020). This one takes you to Little Cliff Pond, crossing a paved camping entrance road on the way. At Little Cliff Pond, choose either shore to follow the trail markers north to Cliff Pond (021-024). At Cliff Pond, you can walk north past the boat landing to trailhead 2 above. You can then return to trailhead 1 directly by walking west on the Cliff Pond Trail around the north shore for 0.3 mile to the picnic grove described below. Or to continue the long walk, head south around Cliff Pond, following the trail markers (025-029). In about 0.8 mile, you will be walking along the shore of Cliff Pond above a marsh which used to be Grassy Nook Pond. This is an excellent spot for lunch. You can continue around Cliff Pond following the trail markers, or take a scenic detour. If you go south just past Grassy Nook (030), you will walk a paved road for a bit to reach the bike path at the southern perimeter of the park (031)..
down to the shore on the side path. It is an unspoiled, wild environment. Circle Ruth Pond and continue northeast through the pine grove planted by the Civilian Conservation Corps in the '30s (035). When you get to Nook Road (paved, two-lane) (036), look for the sign to Fishermen's Landing across the road. Walk east 0.1 mile to the shore of Cliff Pond (037). You are now at trailhead 3, 2.4 miles from trailhead 2. Now hike north around the shore of Cliff Pond. You may need to dogleg around the shore at 0.2 mile (038). At 0.6 mile, you pass a little side pond on the left (039). Trailhead 2 is 0.4 mile ahead around the pond. Turn north through a picnic grove and follow the path up the hill and over to Flax Pond, which will be directly north (040). 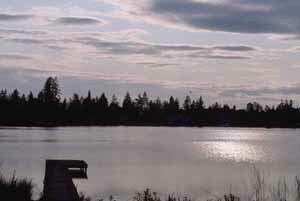 Walk around the west shore of Flax Pond and walk uphill to the camping area above the north shore (041-042). A telephone right of way goes off to the left. Follow it directly west to the main road, cross over (043), and pick up the bike trail heading west. to reach the Cape Cod Rail Trail, you've gone a bit too far. But just walk to the right, then right again immediately. Altogether, this has been a ten mile hike, avoiding the paved paths as much as possible. Nickerson Park is spectacular in the fall, when the trees have colored foliage, and only an occasional fisherman shares the solitude with you. you can see much more through the trees. No wonder that Nickerson is the jewel of the state parks!